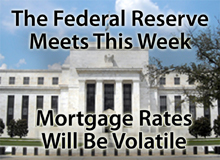 Mortgage markets worsened last week in a holiday-shortened trading week. As the body of U.S. economic data continues to show slow, steady improvement, Wall Street is becoming a net-seller of mortgage-backed bonds. As a result, conforming mortgages rates in Utah are rising. This is why conforming and FHA mortgage rates rose last week in Utah. Existing home supplies plunged to a 2-year low in December, and unemployment claims dropped more than expected, giving hope for the U.S. economy in 2011. This week, that trend may continue. There’s a lot of news set for release. The biggest story of the week is Federal Open Market Committee’s 2-day meeting. Scheduled for Tuesday and Wednesday, the FOMC’s meeting is the first of its 8 scheduled meetings this year. In it, the FOMC is expected to vote the Fed Funds Rate unchanged in its target range near 0.000 percent, but it won’t be what the Fed does that’s so important to mortgage markets — it will be what the Fed says. Wall Street will be watching the FOMC’s post-meeting press release for clues about the economy, and the central banker’s next steps. From what it reads, Wall Street will react. This week is also heavy on housing data. Strength in housing should lead mortgage rates higher as it becomes more clear that the sector is on solid ground. Since November 3, mortgage rates have been trending higher across the country. The Refi Boom is over, but low rates remain — for now. If you’ve yet to lock a mortgage rate, consider doing it soon. Before long, rates won’t be so low. This entry was posted on January 24, 2011 at 6:47 am and is filed under Weekly Review. You can follow any responses to this entry through the RSS 2.0 feed. You can leave a response, or trackback from your own site.